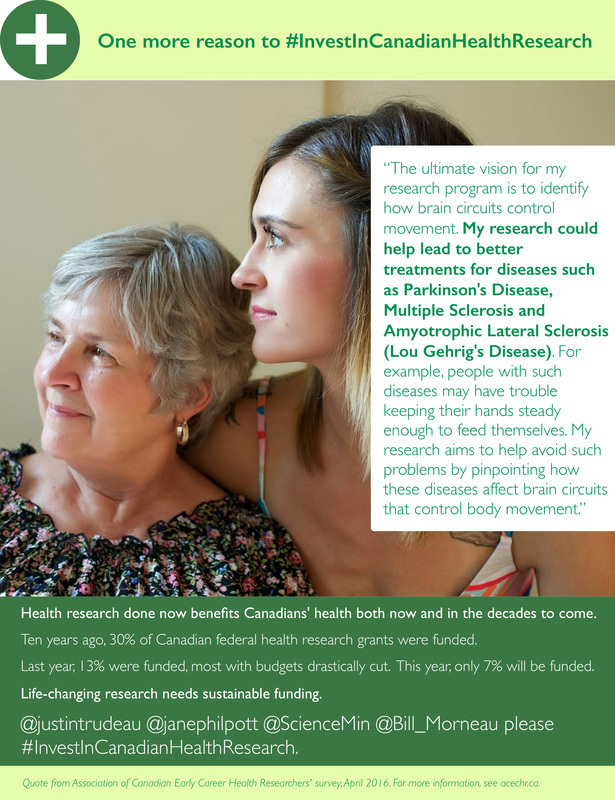 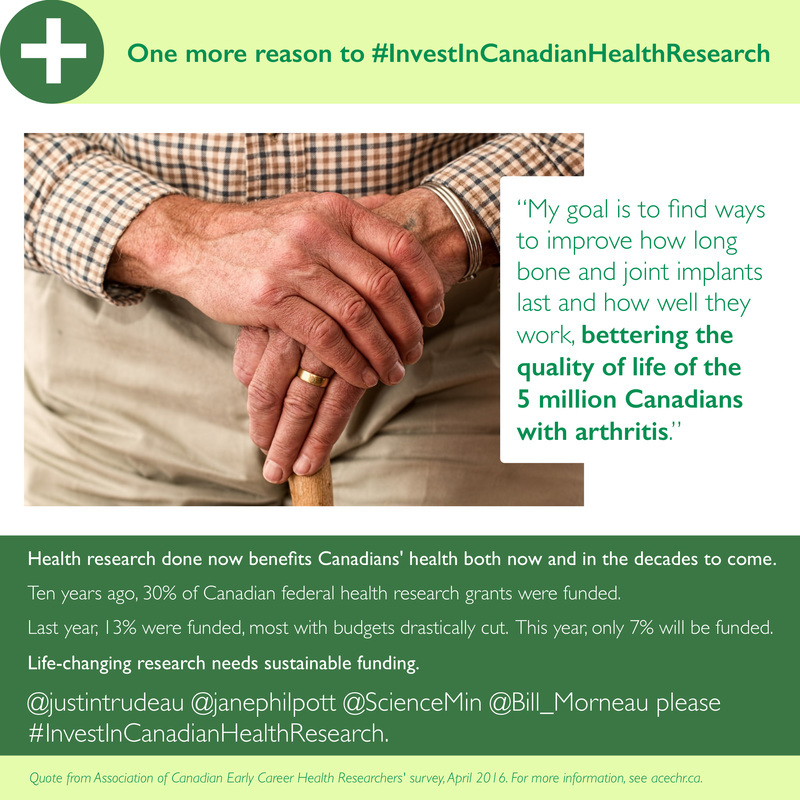 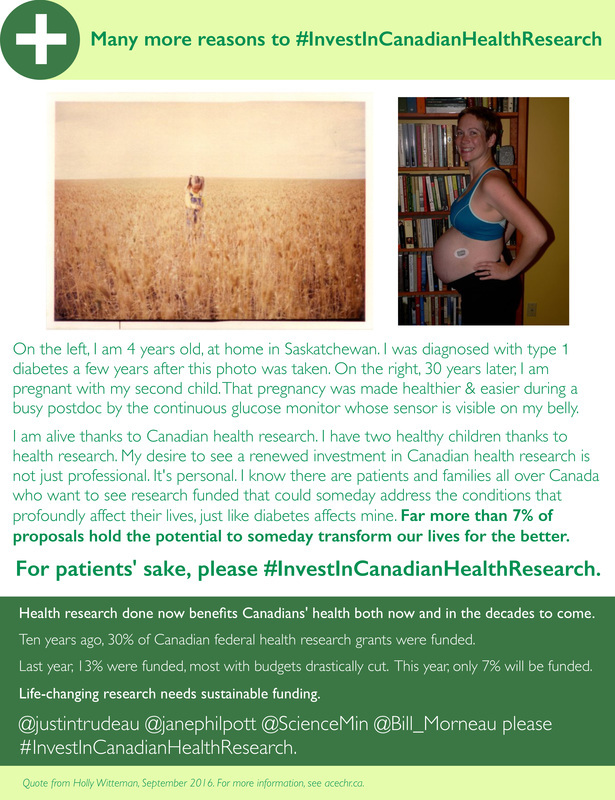 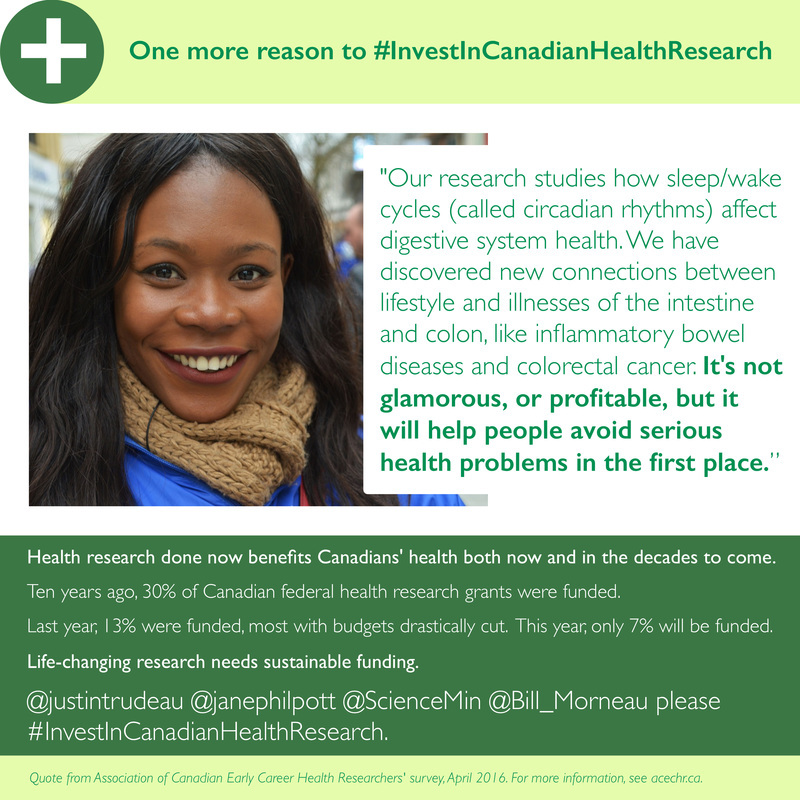 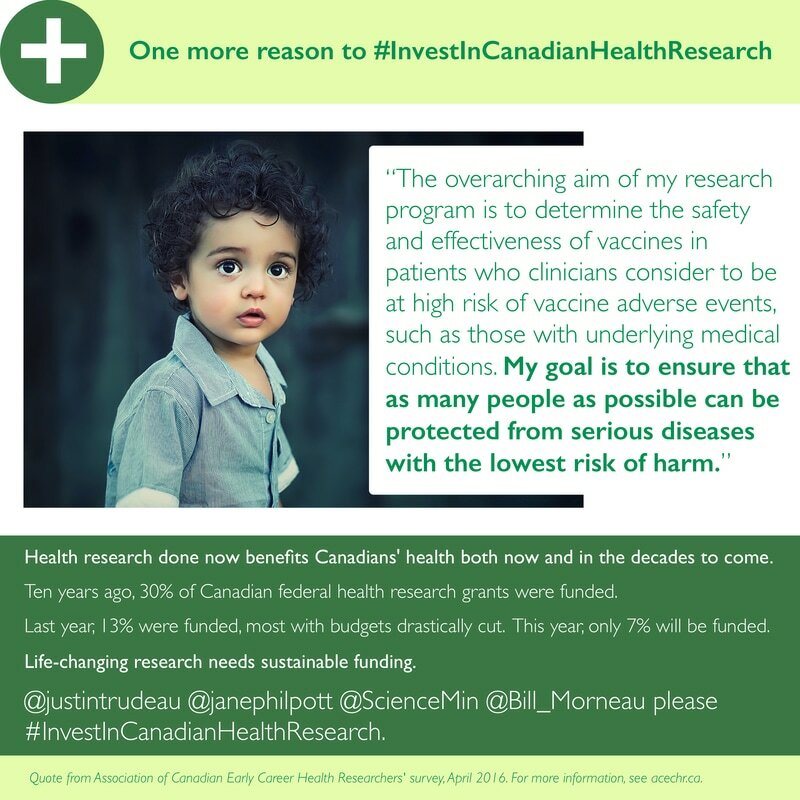 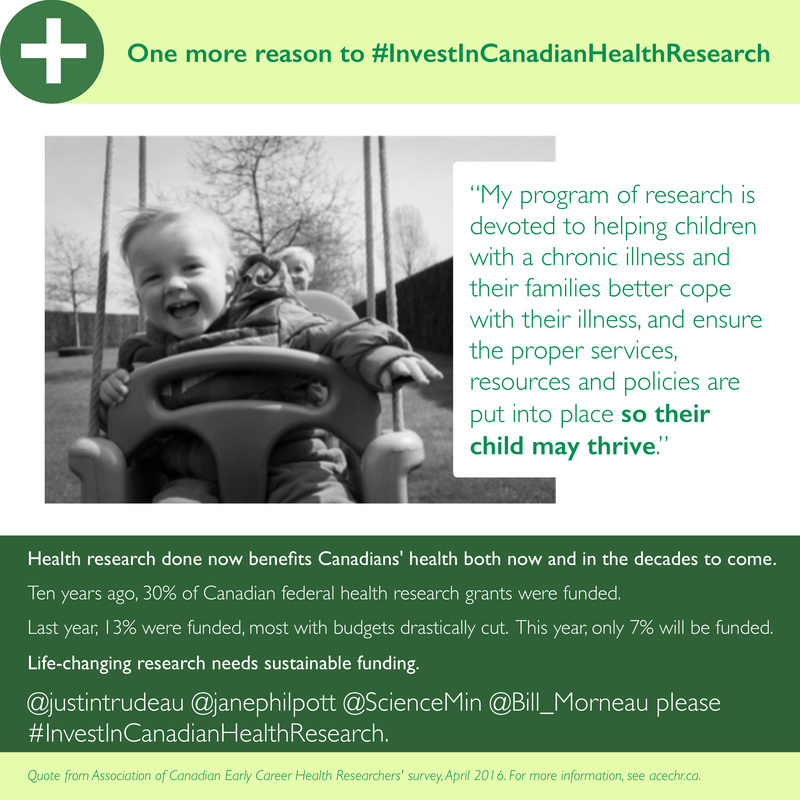 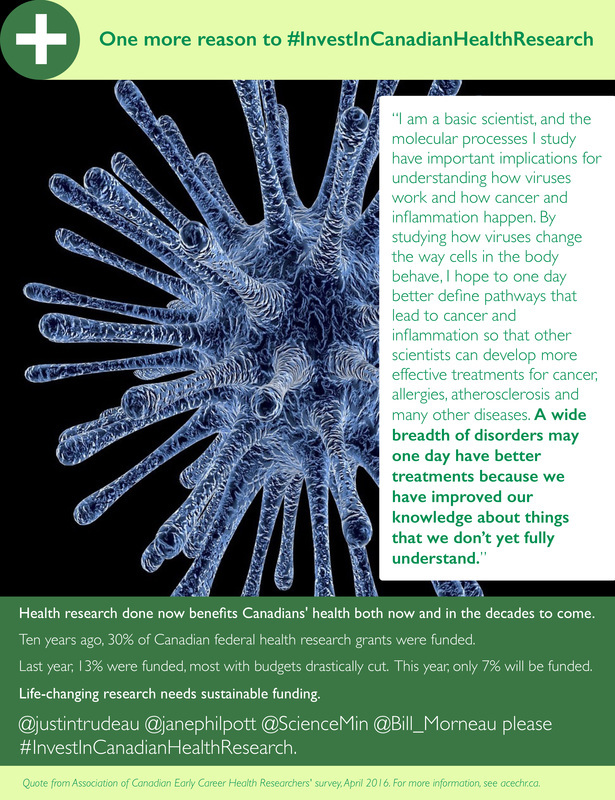 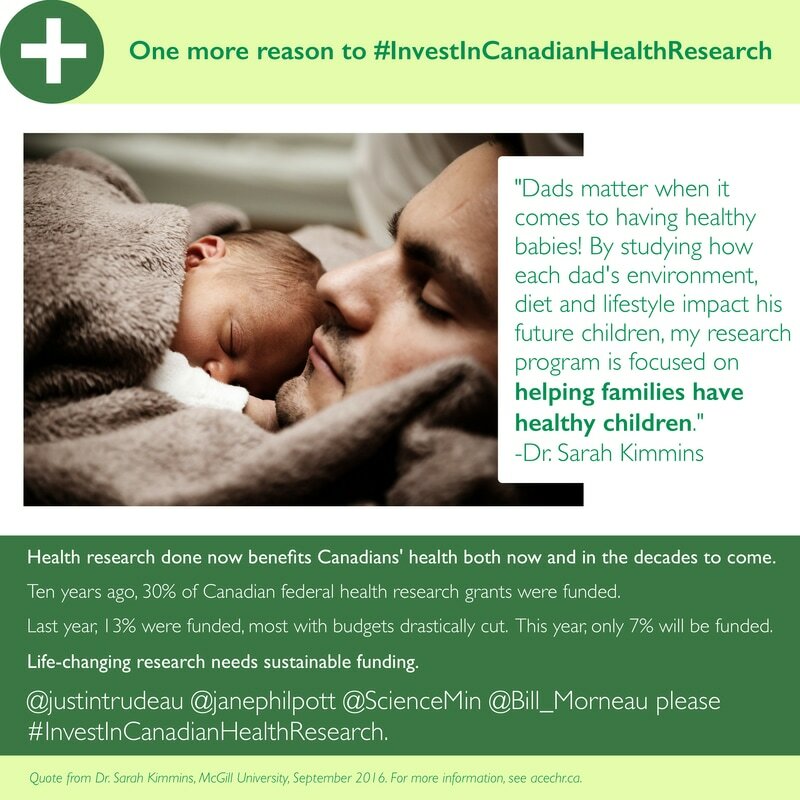 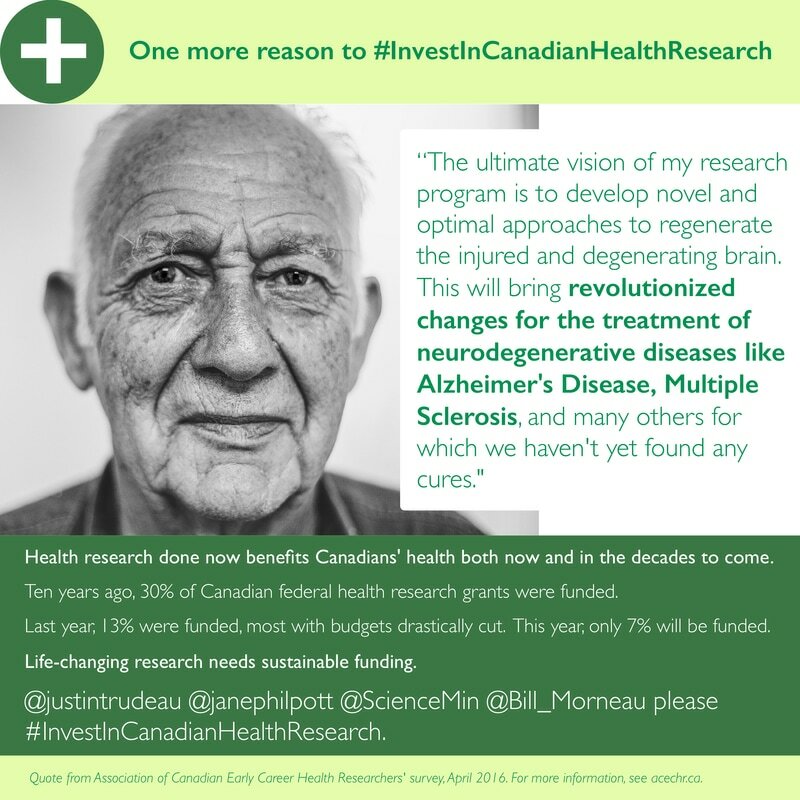 Funding rates for Canadian health research have fallen dramatically over the past 10 years. 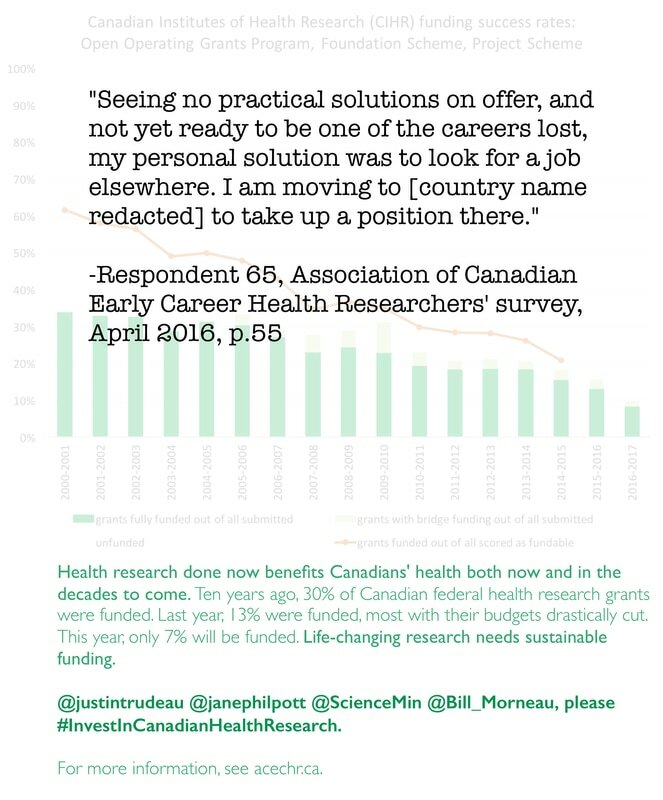 Researchers who are new faculty or scientists (early career, less than 5 years in their appointment) or who are in the early part of mid-career (6-10 years in their appointment) are being particularly hard hit. 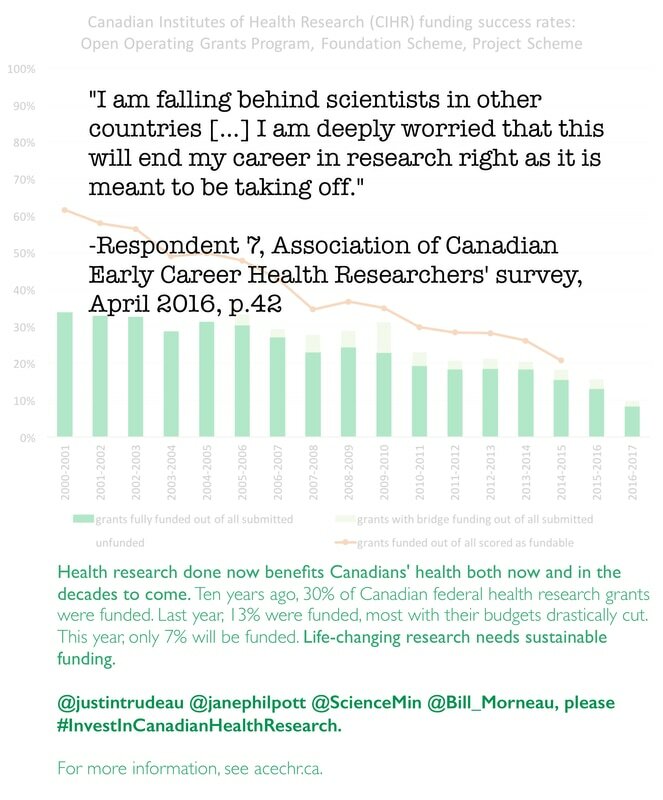 We are at risk of losing a generation of scientists. 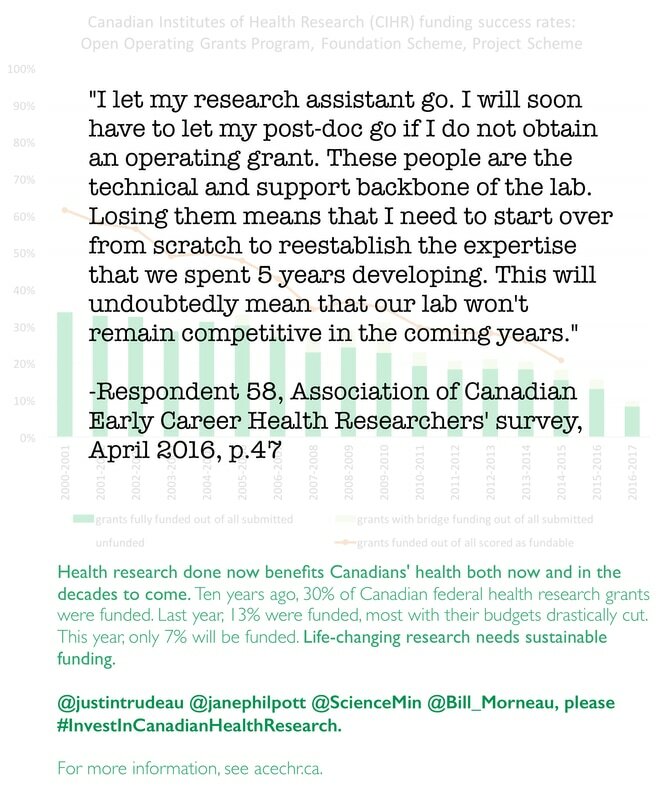 If we lose our scientists, we lose all the investment made in them (usually funding over 1-2 decades of training) and all of their potential discoveries and findings. 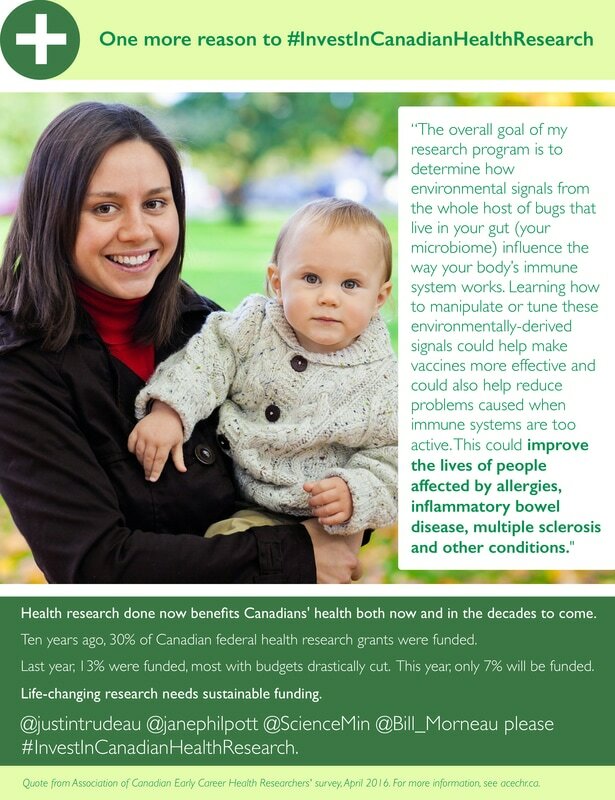 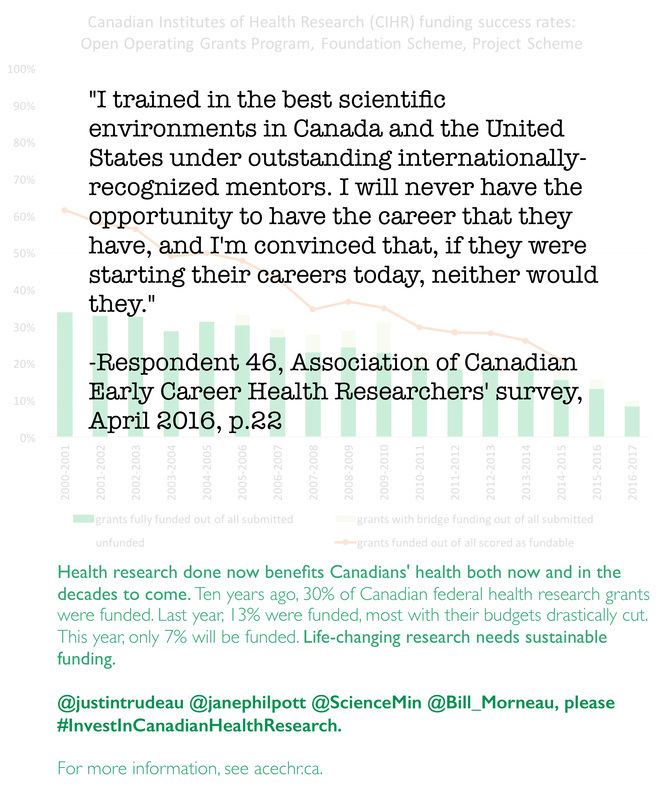 See our survey for details of what is happening among early career health researchers in Canada. 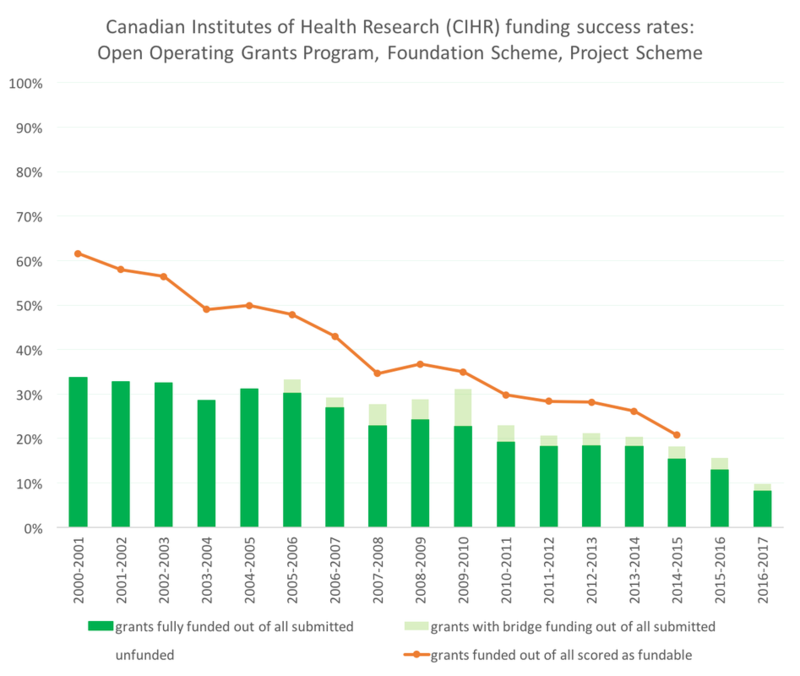 The graph below shows the success rates for grants submitted to the Canadian Institutes of Health Research (CIHR) in open funding competitions, including the Open Operating Grants Program (OOGP), Foundation Scheme (FScheme) and Project Scheme (PScheme). 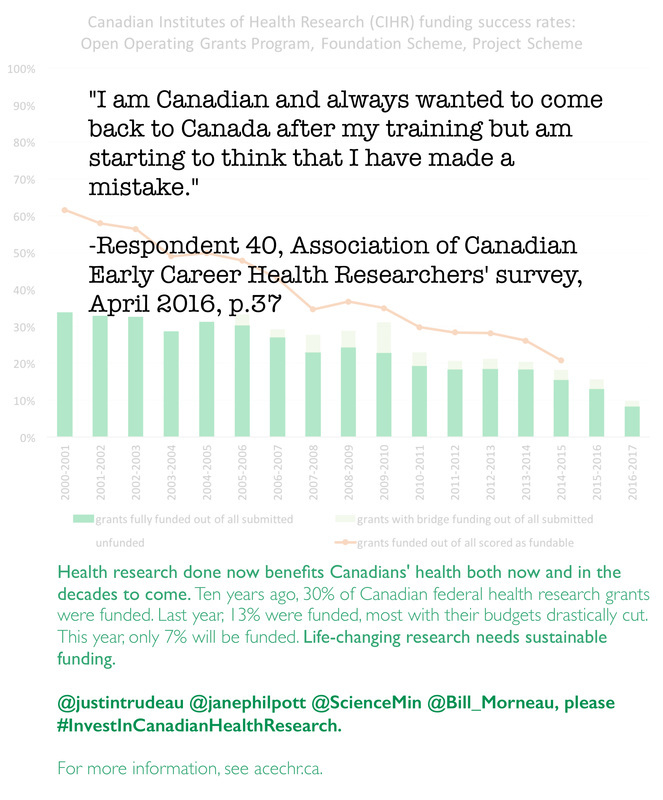 The dark green bars show the proportion of grants that were fully funded out of all submitted, often with across-the-board budget cuts. 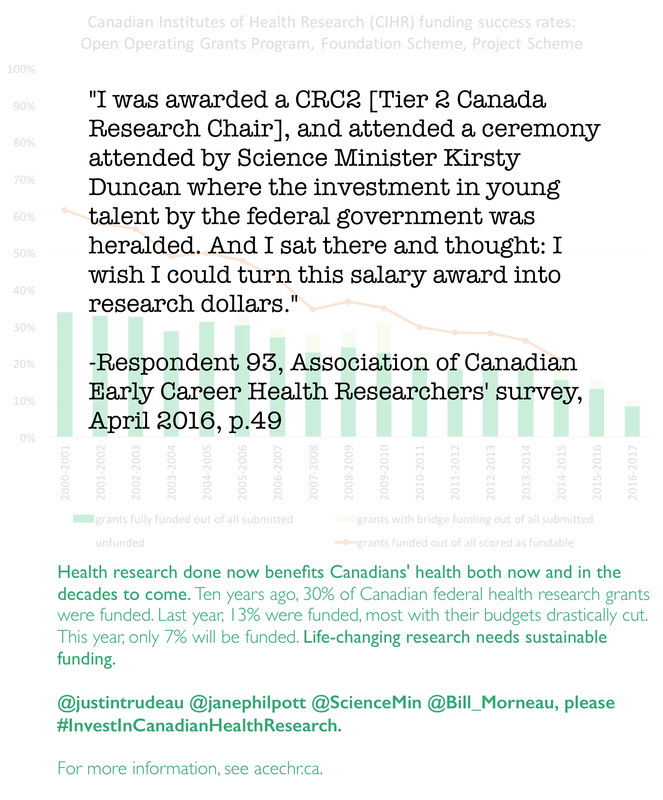 The light green bars show the proportion of grants that received bridge grants (one year grants meant to provide a 'bridge' to the next competition) out of all submitted. 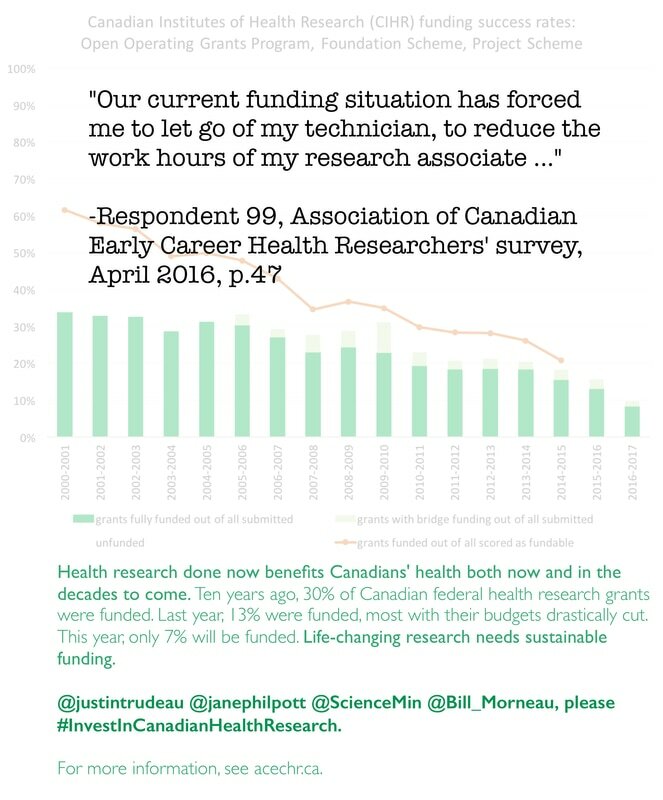 The orange line shows the proportion of grants that were funded out of all those that received a fundable score, meaning that expert peer reviewers thought the grant was high quality research worth funding. 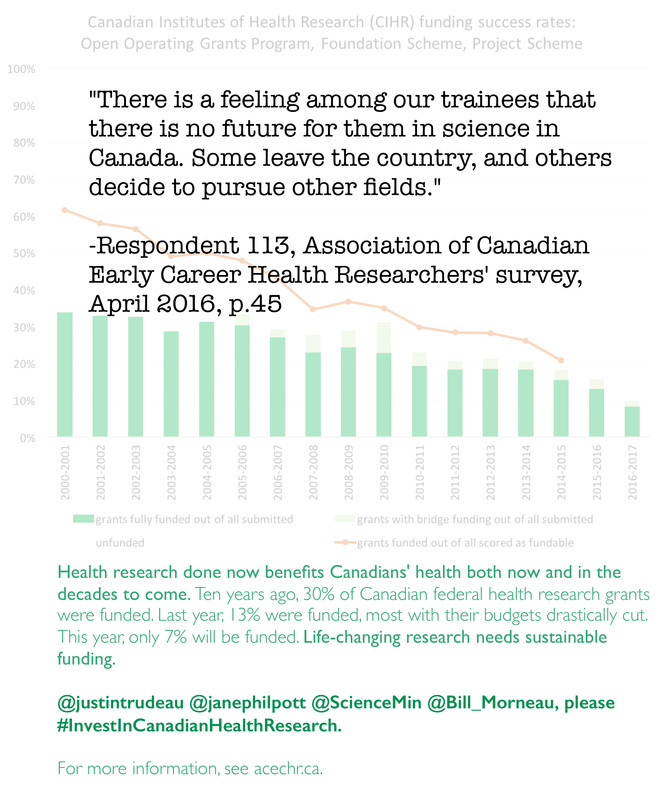 The orange line stops after 2014-2015 because reviewers no longer provide such a score in the new granting system. 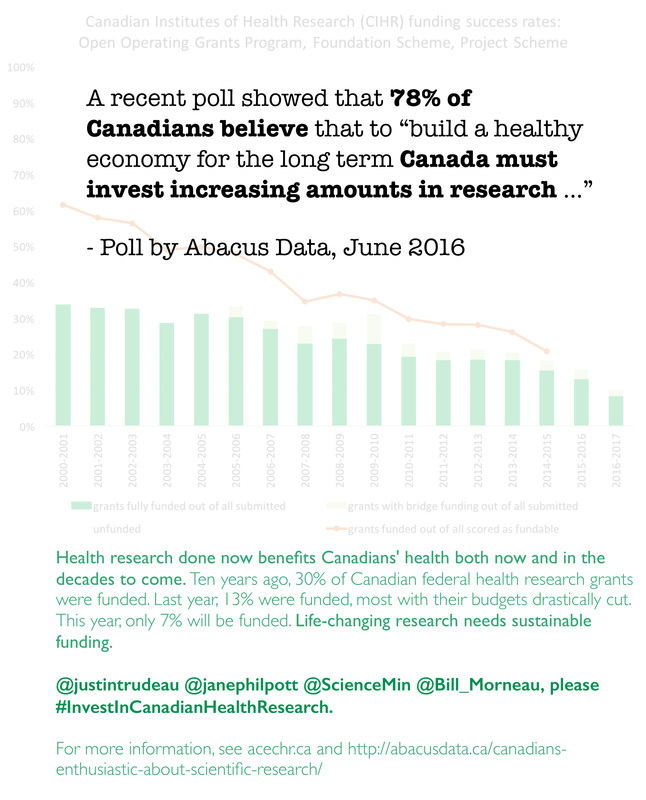 Data are from http://www.cihr-irsc.gc.ca/e/44063.html#fig9 (2000-2001 to 2004-2005) and http://www.cihr-irsc.gc.ca/e/49273.html#fig1 (2005-2006 to 2014-2015). 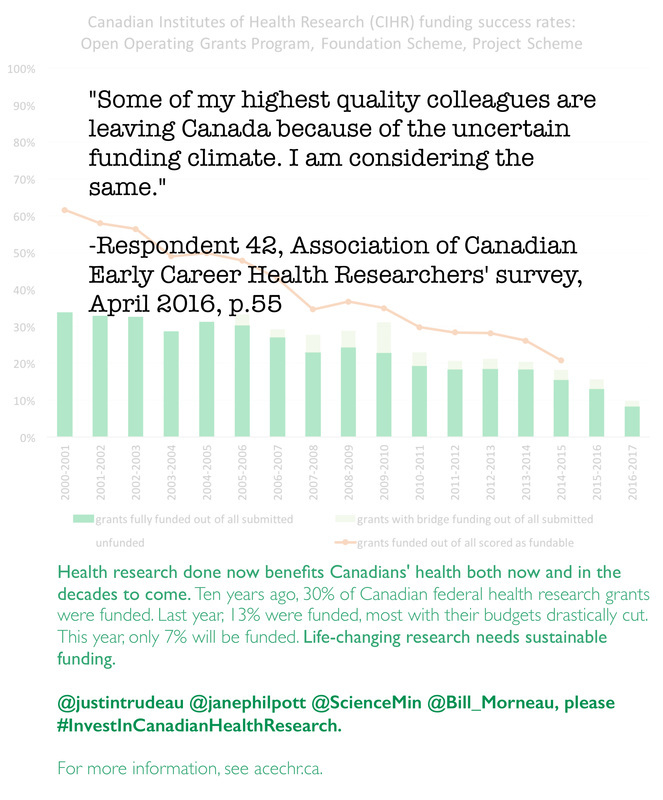 We lack data on bridge funds prior to 2005, which may change the heights first 5 columns. 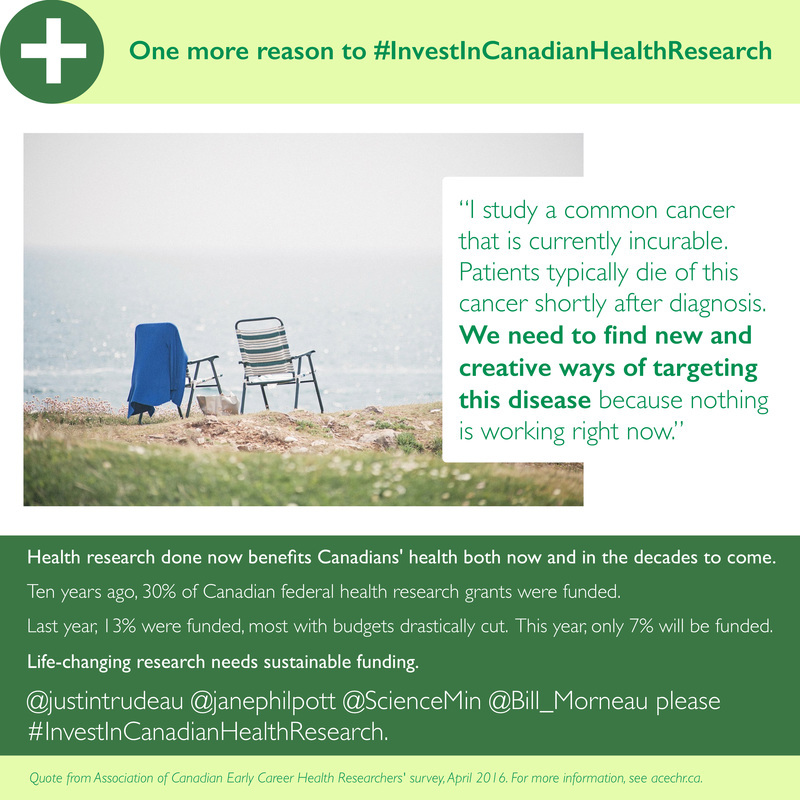 Bridge funds in 2005-2015 added median 3% (IQR: [3%,4%], range: [2%,8%]) to CIHR’s total reported success rates. 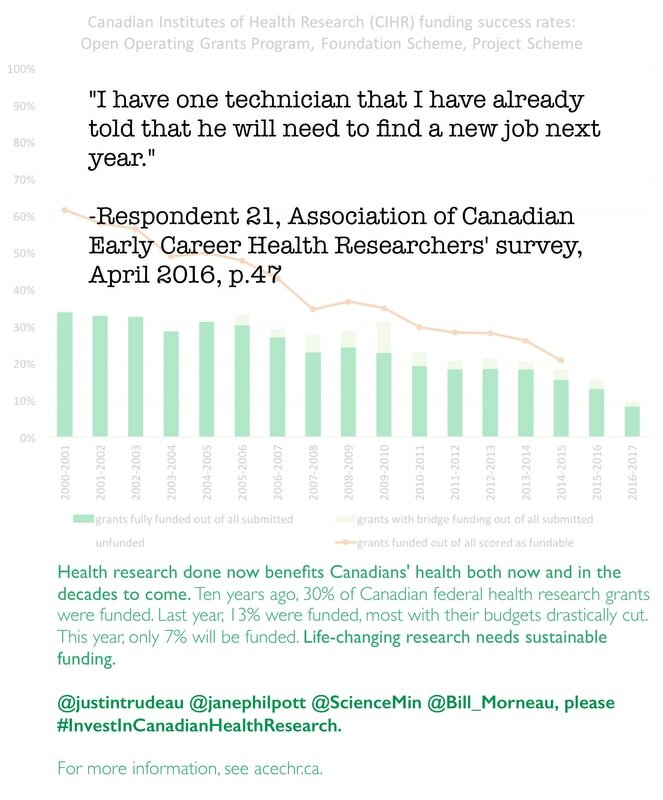 The fully funded success rate for 2016-2017 was projected by CIHR and aligns with the overall budget envelope, mean total grant sizes awarded in the Foundation and Project Schemes in 2015-2016, and projected application pressure. 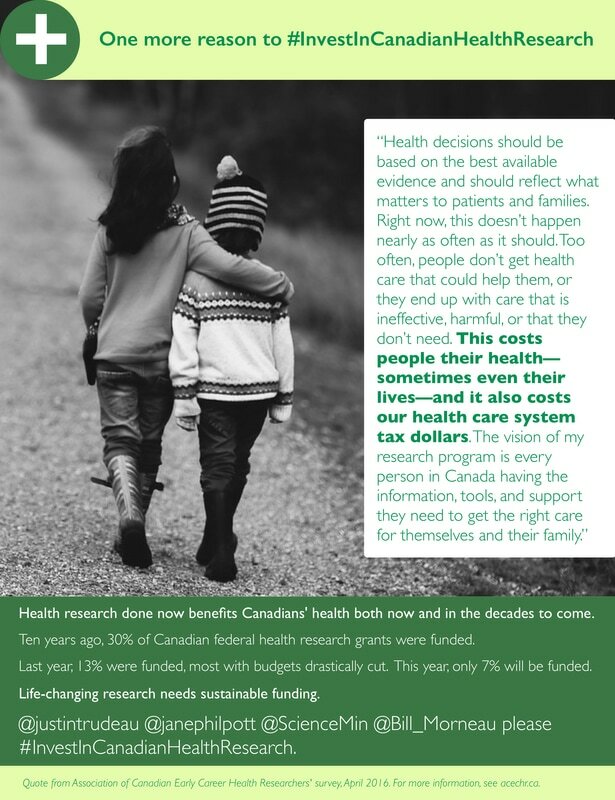 Go ahead and make your own if you want!